It drives you nuts. All of a sudden, the scale won’t budge. You’re exercising, you’re on the Pritikin Eating Plan, and you’ve lost a bunch of weight over the last few months, but now you've hit a weight-loss plateau. What do you do? Many of these tips will help you choose foods that fill you up with the fewest calories. It's one of the best ways to break through a weight-loss plateau! The really good news is there’s plenty you can do to break through your weight-loss plateau. So you’ve got to make a change. You can’t expect that you’re going to somehow magically break through. 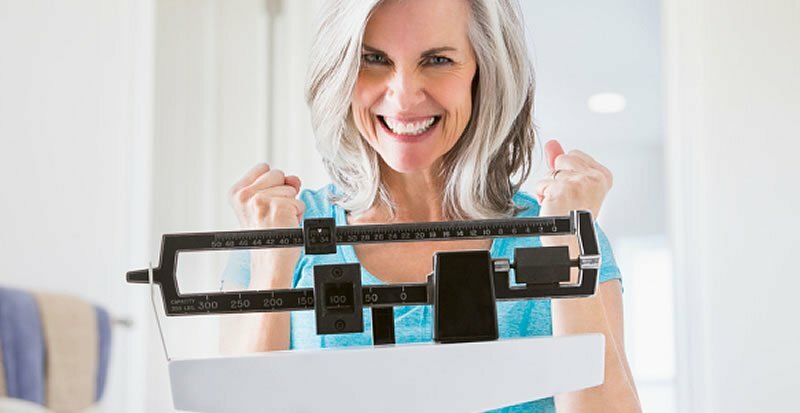 “The only way to break through your weight-loss plateau and lose more body fat is to cut calorie intake further and/or burn more calories through exercise,” advises Dr. Kenney. Easier said than done, we know. Especially cutting more calories. The key question is: How do you cut calorie intake further without feeling chronically hungry? “Few people can live with chronic hunger for long,” states Dr. Kenney. All too soon, your brain starts taking you places you don’t want to go – a U-turn into the drive-through lane at Taco Bell, a mad dash to the cookie aisle at the store. Oh, how quickly 1,000 calories of Oreos can go down, especially if you’ve been starving yourself. To break free of temptation – and break through weight-loss plateaus – you’ve got to keep your mind off food. “And the best way to keep your mind off food is to keep hunger at bay,” advises Dr. Kenney. Sure, you’ve got to eat calories to feel full, but you don’t have to eat a lot of calories. The right types of foods can curb appetite and calorie intake. Your secret to success? Get as much satiety as you can for every calorie you eat. Satiety is the flip side of hunger. The more satisfied, or satiated, you feel after eating a meal or snack, the less hunger you feel. Without hunger nagging away at you, it’s easier to reduce your overall daily calorie consumption, lose weight, and keep it off. Satiety is also a measure of how long it takes for you to become hungry after you’ve eaten. Does your meal fill you up for one hour? Two hours? Three? The longer it “sticks to your ribs,” the more satiety that meal has. Interestingly, you don’t need a higher calorie intake to get a higher level of satiety. Certainly, if you ate an eight-ounce can of nuts (about 1,400 calories) or a pound of Oreos (2,200 calories), you’d feel full – and you probably wouldn’t need to eat again for a few hours. But you can achieve the same level of satiety on a lot fewer calories. 1. Eat Water-Rich (Not Fat-Rich) Foods. Fill up on water-rich, fiber-filled foods like vegetables, fruits, beans, hot cereals, potatoes, corn, yams, whole-wheat pasta, and brown rice. Foods with a lot of water usually provide a lot of stomach-filling volume, but not a lot of calories. A pound of vegetables, for example, adds up to a mere 65 to 195 calories. Yet it’s one whole pound of food. A pound of fruit is only about 200 to 400 calories. A pound of beans, hot cereals, potatoes, corn, yams, whole-wheat pasta, or brown rice ranges from just 400 to 750 calories. By contrast, a pound of dried cereal, fat-free chips, or white sugar (no water in any of these foods) is packed with 1,600 to 1,725 calories. Talking in terms of pounds is important because the storage capacity of your stomach is two to three pounds, and your stomach really doesn’t care whether you eat 500 calories to fill it up, or 5,000. Once it’s filled to capacity and its stretch receptors have alerted you that it’s full, you’re pretty much done eating. So you can fill up on a big platter of water-rich, fiber-rich pasta topped with marinara sauce and lots of grilled vegetables for about 400 calories or the same size platter heaped with fatty, fiberless fare like a pastrami on rye, potato chips, and cookies for a whopping 1,400 calories. For both meals, satiety is the same, but calorie input is drastically different. Soon, your waistline will be, too. Nicely, water-rich, fiber-rich foods offer one other priceless bonus – they’re the best foods for your health. Scores of studies have found that the populations of the world whose diets are based on whole, natural foods like fruits, vegetables, whole grains, and beans have the longest lives and the lowest rates of heart disease, diabetes, hypertension, and many cancers on earth. 2. Ditch the Dry Stuff. Steer clear of dry foods, particularly high-fat choices, like chips, crackers, candy bars, trail mix, and cookies and other baked goods. These are among the lowest satiety-per-calorie foods you can eat. They force you to choose between being fat or being chronically hungry. Dry but healthier options like bagels, pretzels, dried cereals, fat-free chips, and dried fruit should be limited, too, because all dry foods pack a whole lot of calories into very small packages. It’s shockingly easy to swallow literally 1,000 to 2,000 button-popping calories long before you’ve ever begun to feel satiated. 3. Start Out With a Big Satisfying Salad. Start lunch and dinner with a huge salad full of fresh vegetables. In restaurants, especially, big salads will help fill you up so that you’ll eat less of the more calorie-dense fare that follows. At salad bars, go back for seconds, even thirds! Three cups of salad full of fresh veggies add up to a mere 100 calories. Three cups of salad with cheese, full-fat dressings, and bacon bits tally up 600 calories and more, yet provide little extra satiety for all those extra calories. 4. Make Good Use of Your Soup Spoons. Every day, if possible, enjoy soup, stew, and/or chili (yes, more “wet” food) rich in whole grains, beans, vegetables, and a little lean animal protein like fish or chicken – or no animal protein at all, if you prefer. Soups, stews, and chili can “provide a whole lot of satiety per calorie if they are low in fat and high in fiber-rich foods,” says Dr. Kenney. In several studies at Penn State University, scientists found that people who ate veggie- and grain-rich soups and stews tended to eat fewer calories overall by day’s end than people who did not eat any soups or stews for the day. 5. Don’t Drink Your Calories. The same goes for fruit and vegetable juices. After a glass of orange juice, you’re far more likely to consume more food (and more calories) than if you’d eaten a whole orange. 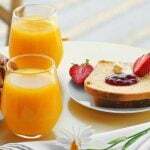 What’s more, the glass of orange juice alone is double the calories (100 to 110) of a medium-sized whole orange (50). And every calorie does count. Just 100 extra calories per day can easily translate into about 10 added pounds per year. So rather than drinking fruit juice, eat your fruit. Peel an orange. Finish off a big crisp apple. Snack on carrots. For the calories in one kid-size box of apple juice, you can enjoy an apple, an orange, and a slice of watermelon. Now that’s satiating. When you’re satiated, the only foods that may tempt you to eat more are those that are low in satiety yet high in calories, like rich desserts. “Rich desserts are great for packing on the pounds but a disaster if you want to lose weight and keep it off,” warns Dr. Kenney. Eat only when you’re hungry. That doesn’t mean you wait till you’re famished and lunging for every cheeseburger in sight. Rather, listen for those little hunger pangs that tell you, “Time to eat.” Then go ahead and eat. By waiting to eat till you’re hungry, you’re getting more satiety out of that meal than if you’d eaten the same meal when you weren’t hungry. More satiety means less calorie intake overall. “Research shows that people who were told to wait till they were hungry to eat an afternoon snack ate fewer calories at dinner than people who ate the same snack earlier in the afternoon, when they weren’t hungry,” says Dr. Kenney. Hunger makes everything tastes better. “If you’re really hungry, a plain baked potato, a little piece of fish, and some steamed vegetables tastes pretty darn good,” laughs Dr. Kenney. By contrast, food like baked potatoes and veggies will seem unappealing if you’re constantly eating (hungry or not) low-satiety, high-calorie foods like fatty meats, croissants, and chocolate. A low satiety-per-calorie diet results in a vicious pattern of eating mostly fattening foods, which lead to increased body fat stores and increased risk of heart attacks, many types of cancer, and numerous other ills. If you’re still hungry after dinner, enjoy fresh fruit. Splurge at the market or restaurant on the choicest, most delectable of seasonal fruits – raspberries, strawberries, cherries, peaches, mangoes, guavas. “Sweet” doesn’t get any better! If fruit seems unappealing, you’re not really hungry. So at day’s end, what’s really going on? Cravings for calorie-rich desserts happen, not because of hunger, but because of bad food habits. “The only way to get free of these cravings is to not give in to them,” counsels Dr. Kenney. It’s tough. Evening is the witching hour, that time when other feelings take over, like boredom, anxiety, anger, or the need for a reward, driving us to indulge. Many of us eat the most fattening foods of the day at nighttime – when we’re not hungry. There’s no question that boosting your calorie burn from exercise can accelerate loss of excess body fat. That’s why the Pritikin Program recommends a comprehensive plan involving about 60 minutes of aerobic activity at least six days a week, resistance training two to three times weekly, and stretching, optimally every day, explains Scott Danberg, MS, Director of Exercise. And, of course, no amount of exercise makes up for a lousy diet. “I don’t care how long you go for a jog in the morning if you do what Bill Clinton used to do and stop off at McDonald’s for an Egg McMuffin. This plan won’t produce weight loss. It’ll produce heart disease,” warns Dr. Kenney. It really is true: Nothing tastes as good as being thin feels. Nothing feels better than going down a dress size, and another, and another – or cinching your belt tighter and tighter. 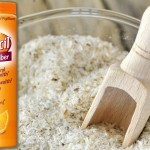 Does Metamucil lower LDL cholesterol?